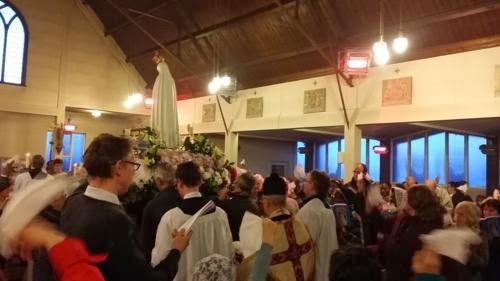 The Day With Mary is a spiritually powerful event in the parish. 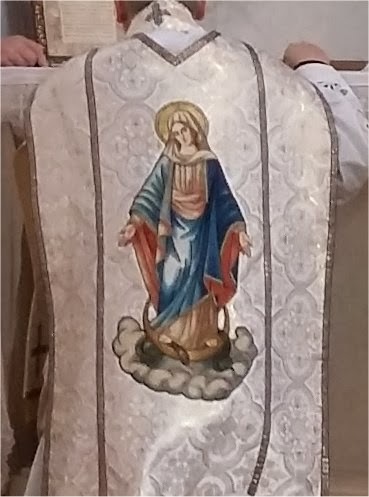 Not only does it give a boost to the faith and devotion of those present, it has the feeling of making a real contribution to the treasury of merits of the Church with the assistance of Our Blessed Lady and under her powerful protection. Fortescue has a famous footnote about not genuflecting at the top of a ladder when retrieving the monstrance from a throne (I am grateful for his prudent advice) but he says little more about liturgical ladders. 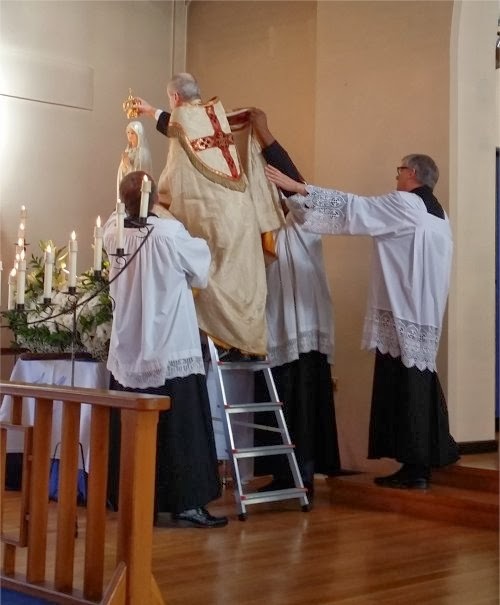 When I was crowning the statue of Our Lady, the assistants did well to retain hold of the cope without showing the orphreys. Yesterday morning was fine and we took the Procession of Our Lady around the streets. Sung Mass followed. The afternoon procession of the Blessed Sacrament was a little more edgy owing to a fairly brisk wind which threatened to take the canopy and bearers skyward. 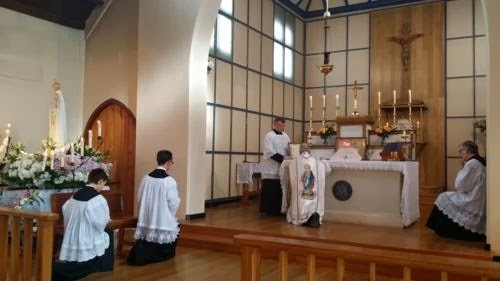 The afternoon was devoted as usual in the programme, to adoration of the Blessed Sacrament, meditations on the Passion of Christ and prayers for the faithful departed. During the day twenty decades of the Rosary were said, and there was plenty of time for silent adoration. With several priests kindly hearing confessions, and the public recitation of prayers for the Pope, we can hope that many plenary indulgences were gained. The day ends with the Fatima "Farewell" hymn at the "departure" of the statue of Our Lady of Fatima. This year we had an even better turn-out than usual with plenty of children taking part - and plenty of men, as one lady commented to me. Over the lunch and tea breaks I had some fun with the DWM Team. At the extensive bookstall I asked if they had any books advocating women priests and gay marriage: they were unable to help. At the piety stall, I enquired about yoga equipment but again, no luck. I was also unsuccessful in my search for DVDs of liturgical dance: all they had were lives of the saints and presentations of Catholic doctrine. I'm obviously behind the times. 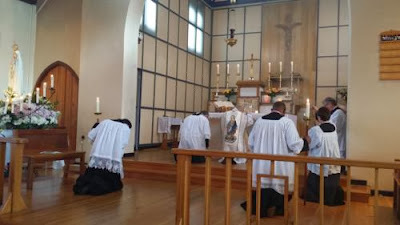 The fashion among young people now, it seems, is to be addicted to the traditional liturgy and I am in a "with it" parish.